Gordon was a member of the Adelaide Hills Amateur Radio Society (AHARS) almost from its inception in 1983. The success of the club can be traced back to its early years, which placed it on a strong foundation. Gordon was Club Secretary from 1984 to 1989, Vice President in 1989, attended several Club Conventions, and organised the club’s first Annual Sale Days, which continue to the present. Those sale days are a most important (if not the most important) event in Amateur Radio in this state. In 1986, 1987, 1988, and agin in 1989, Gordon was a delegate for AHARS at the WIA Club Convention. Gordon became a Life Member of AHARS in 1989, in recognition of his invaluable service to the society. Of great importance to AHARS was the historical work that Gordon did for the club, chronicling the formative years of the society. Gordon attended the opening of the society’s new Activity Shack. Gordon became silent key on 14th December 2011, at age 83. His funeral was held at the Florey Chapel, Centennial Park on Tuesday 20th December 2011. 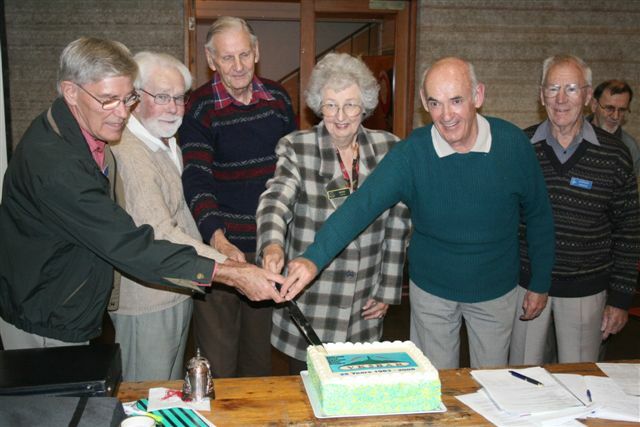 Above:- Gordon (far right, in striped jumper), at the AHARS 25th year Anniversary.